Hey, I know it’s been a long time. My aspirations to write a weekly blog pretty much went out the window after my last posting in…October? Life, heartache, loss and writer’s block seem to keep me off the page. My best “writing” occurs at night when my eyes are closed and I’m ready to drift off to sleep. So the other night I put a notebook by my bed and wrote down ideas as they came to me, before I fell asleep! I WILL cure this writer’s block yet! Time’s change. A seemingly lost friendship is always difficult to deal with, and mine is no different. Where once conversation was easy, it’s now stilted and awkward. But life moves on and people make different decisions and that’s okay. Little reminders along the way of things shared together in the past make the memories that much more bittersweet. Wines tasted together during the times spent together, now bring different memories when consumed again. I don’t drink wine to forget, I drink wine to remember. And the remembering is an important part of the journey and moving forward to the next thing. Last night was our monthly tasting get together. A great group of people I’m involved with meet once a month to taste wine and discuss. The theme was sparkling wine (no parameters as long as it had bubbles!) and there was a great array of bottles brought, including the exclusive 2006 Taittinger Comtes Blanc de Blancs. As part of the discussion, we always ask how much said bottles were. This particular one was quite expensive. If one were to go buy it off a retail shelf (which you pretty much can’t do now as it’s all gone) it would cost you almost 300 bucks a bottle. But for my buddy that brought it, no matter the price, there was no doubt in his mind that he’d share it with his peeps because that’s what you do with good wine…you share it with people you love, you want to be with and that will appreciate it. All three categories may not prevail in every case, but I would say that last night all three did! 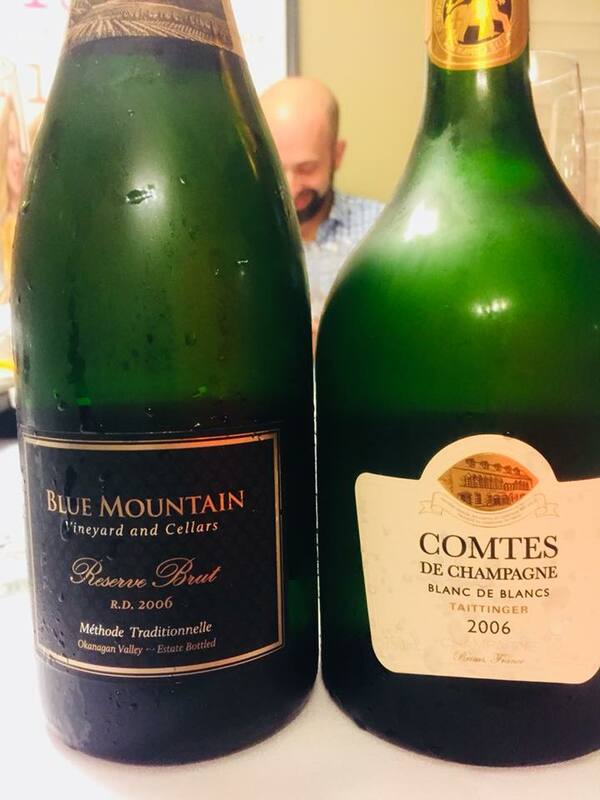 It’s one of those experiences that I will never forget, and if I’m ever fortunate to taste another bottle of Comtes, whatever the vintage, I will remember this night. So, yeah, I don’t drink wine to forget, I drink it to remember. Life is short…drink more wine. I’ve been told on many occasions that I am greatly blessed and highly favored. I don’t take that phrase lightly, but when it’s told to me by several people that do not know each other in any way, I pay attention. 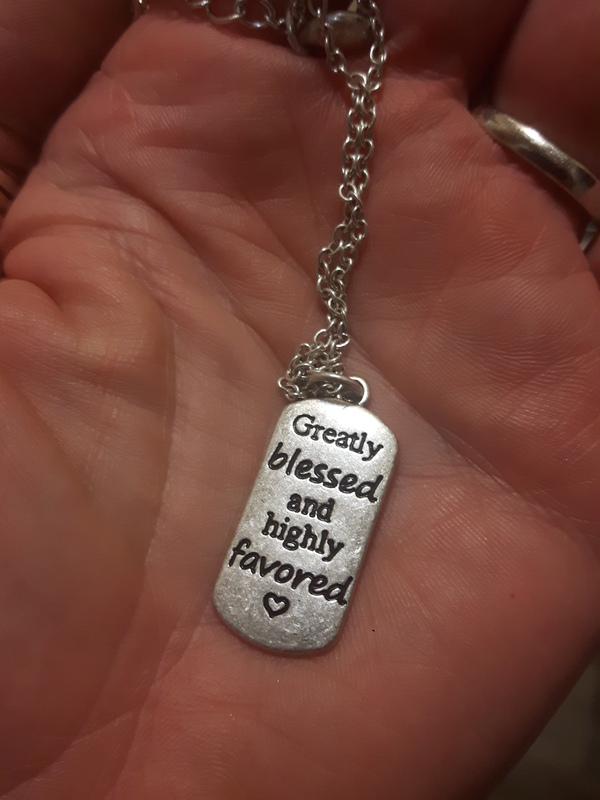 So, when I found a necklace that said that very thing, I knew it was a sign, and I wear that inexpensive little thing with a great deal of pride and a blush every time someone reads it out loud as it’s hanging around my neck. Yeah, I am. Since it’s December I always have a chance to look back on the year and see what I’ve accomplished. Truthfully, life’s been pretty good, and what I may be going through is minutiae compared to other friends my age who are losing their parents, spouses or other deeply loved ones. Now that’s tough, and I won’t really know what they are going through unless I go through it myself. And the hope is always that it never happens tomorrow. But in the meantime, life is short, so I’ll drink more wine. No, not excessively, ever. But tasting, appreciating, learning, sipping, remembering, reminiscing, reflecting, sharing and I hope, with lots of smiles and laughter. Salute, Cheers, Santé, Prost, Salud, Chimo, Saude…whatever you prefer, I raise my glass to you! This entry was posted in Joy of Wine, Personal Stories and tagged blessed, bubbles, Champagne, Christmas, education, favoured, friends, friendship, happy, heartache, holidays, joy, learning, life, moments, New Year, next thing, past year, remembering, teaching, toast, wine, year. Bookmark the permalink. 4 Responses to Life is Short…Drink More Wine. Great night indeed and so is this article! Enjoyable post, Joy of Wine! Gentle reminder life is short and we need to enjoy. Happy Holidays & good Cheer! Thank you! And good cheer to you! Yes Joy of Wine, all three categories were in play on Monday night at the bubbles tasting! And one of the top highlights was our group “chardonnay hater” that LOVED LOVED LOVED the Taittinger Comtes! That was worth the price of admission itself.